Baby Rhino Satara at Baby Rhino Rescue | Adopt and Donate Now! She is probably the first orphaned baby rhino to be rescued from the KNP. The previous policy was that the animals had to face their natural fate should their mother have suffered a mortal blow. This was reversed due to the extreme loss of rhino in the park. It was also decided that poaching is not a “natural” occurrence, and as such, the baby rhinos need to be supported when this occurs. Satara is one of the gentlest of all the rhinos at Care for Wild Africa. She welcomes contact with people and is always reliable, even-tempered and tolerant. This is probably because she had so much attention when she first came to the sanctuary. She was the only true baby rhino at that time and both the volunteers and permanent staff had time to languish affection on her. You can do anything to Satara, even wrestle her around and she happily allows it. Satara is extremely inquisitive. When she was introduced to a new pen, she went on a long walk, thoroughly examining everything about her new world. Her best friend is Tank. They are always together. They share their night pen and boma with Robyn and Skylar. 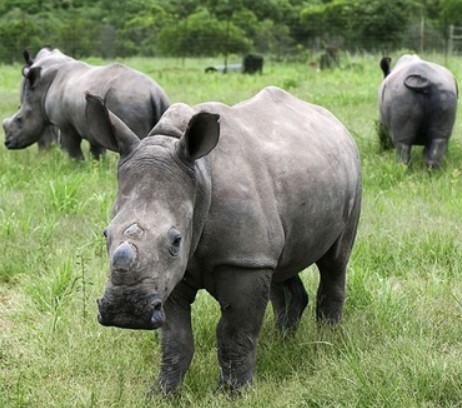 All four rhinos love one another and they have found their new family. They have recently been introduced to the great outdoors beyond their enclosure and spend the day grazing on succulent green grass.